Fun idea, take the challenge!! Lately I’ve been having a lot of fun writing one or two sentence stories and finding suitable pictures to illustrate them. Occasionally I’ve done it the other way round; seen a picture and thought of a story to match it. Today it’s your turn. I’m posting a painting that I’ve used before to illustrate a poem, Odilon Redon’s Flower-Clouds, and I’m throwing it open to anyone who wants to have a go at writing a one or two sentence story to go with it. Post it on your blog and leave the link in the comments box below, or leave the story in the box if you’d rather. If there’s a good response I’m make it a regular challenge with a set day and I might even pick a weekly winner. If nobody’s interested I’ll forget I ever mentioned it. Powerful story – evocative and provocative! When I was a young boy, my father had one of the first telephones in our neighborhood.. I remember the polished, old case fastened to the Wall. The shiny receiver hung on the side of the box. Then I discovered that somewhere inside the wonderful device lived an amazing person. Her name was “Information Please” and there was nothing she did not know. Information Please could supply anyone’s number and the correct time. My personal experience with the genie-in-a-bottle came one day while my mother was visiting a neighbor. Amusing myself at the tool bench in the basement, I whacked my finger with a hammer, the pain was terrible, but there seemed no point in crying because there was no one home to give sympathy. Thank You! This is for You. Hey Ali, first I love the book cover! Very pretty and it would seem to go with the genre. Thank YOU for the free story! I’m downloading it now and look forward to reading it. I may even share it with my human, Emily. Speaking that name reminds me…are’t you the writer doing a story about a cat named Zoe adopted by a girl named Emily? You know we are dying to read that!! In Monday’s post, I said that something wonderful was about to happen, at least for me. Well, it happened… today. I had a little message from WordPress congratulating me on my 500th follower! That’s a big deal for me. When I started this blog just over two years ago, I had no idea what to write about, or if anyone would even be interested. I posted my first blog post on 19th December 2012… it got no likes or comments at all until last year! Since then, I’m happy to say things have picked up a little. My most popular blog post since I started is still Hy-Brasil | Mysterious Lost Island of Irish Mythology. Effrosyni Moschoudi was the very first one to suggest to me this little trick, and I have since used it with all my books. Now, Jonathan Gunson has written a great post with the same easy way to sell more books, as a comment on a presentation by Goodreads CEO Otis Chandler. In a survey of Goodreads’ 15 million strong membership, he found that the main driver of eBook purchases was, unsurprisingly, ‘referral by a friend’. But when a follow-up question was put to readers, another powerful sales strategy for authors emerged. The telling response was that 83%wanted tosee what else the author had written. How Can Authors Take Advantage Of This ‘Show Me More’ Moment? I find one of the most talked about topics in writing is “show don’t tell”. It doesn’t seem to matter how much I try not to I still do, and I also find myself repeating words or not describing actions well. 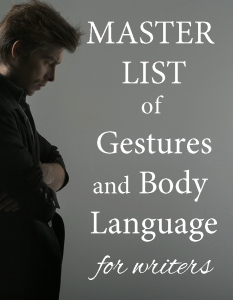 I stumbled on this list of body language for us to keep near us while writing.